"Dogma" is presented in 2.35:1 anamorphic widescreen, and it ranks as one of Columbia/Tri-Star's best transfers ever. Despite some blemishes, specks and scratches that appear here and there, as well as some shimmering and noise, everything else is perfect. The transfer is pretty sharp, though at times it can be a tad soft. I didn't notice much grain, while colors are well saturated and black levels are dead on. Fleshtones and hues are accurate while detail is very good. A superb transfer that I was very, very pleased with. While the original "Dogma" DVD release was purely bare bones, Columbia/Tri-Star was nice enough to announce another version, that being a special edition, was on its way. And after a few setbacks, it's finally arrived. So was it worth it? I think so. Despite the absence of the documentary (which Smith still has plans to release), it's still a great release (and I love the menus for both discs... really creative and in the style of the film). So let's begin with the first disc. Besides the film, you also get two different commentaries. The Audio Commentary with Kevin Smith, Jason Mewes, Ben Affleck, Jason Lee, Scott Mosier and Vincent Pereira is quite a treat. I've enjoyed the other Smith crew commentaries as he has his friends/co-workers join him for a good time. This one is no exception. It's not always screen specific and they sometimes ramble on with things that don't deal with the film at all, but they discuss themselves, aspects of the film and other stuff. This is just a fun track mostly but there are good chunks of information featured throughtout it. Smith fans won't want to miss it, it was one of the better commentaries I've heard in a long time. Don't miss it! This commentary also has a Video Option. An icon of the Buddy Jesus will appear when you have it turned on and during the film you can click it to see some video footage of the commentary, which I liked to see. The men interact with one another nicely. I always like video based commentaries so I was glad to see this, even though it's only for a few parts. Better then nothing. Beware though: because of this, you can't have subtitles or even change to turn subtitles on. The Audio Commentary with Kevin Smith, Scott Mosier and Vincent Pereiera is the second one on the disc and is a lot more serious. It's labeled the "technical commentary" and is actually pretty interesting. They talk about a lot of the shooting, the sets and how things were achieved. I really enjoyed it since this is Smith's most technical film yet, and I really did like hearing how things were done. This track isn't for everyone, but if you're the least bit curious about things in the film be sure to check it out. Finally on the first disc, you can hear some random and pretty funny outburts from this woman who introduces a lot of the menu. Just click and hear... it's called "My Opinion" by Mrs. Harriest Wise. The Storyboards section has storyboard for three sequences "Mooby Sequence", "Triplet Attack Sequence" and "No Man Attack Sequence". The drawings and notes are pretty cool and I was glad to see how things were planned out. Saints and Sinners is quite a unique way to offer Columbia/Tri-Star's usual Talent Files. Set up like baseball cards, you can see the good guys and bad guys featured in the film. But you also get Smith and most of the cast's filmographies and bios. Nicely done. Rounding the set out is the Theatrical Trailer, thirteen minutes of fun Outtakes and a hilarious Jay and Silent Bob's Secret Stash Spot which everyone must watch. Also in the keepcase there's a nice essay by Kevin Smith which I really enjoyed reading and I think fans will too, plus the packaging is pretty spiffy. 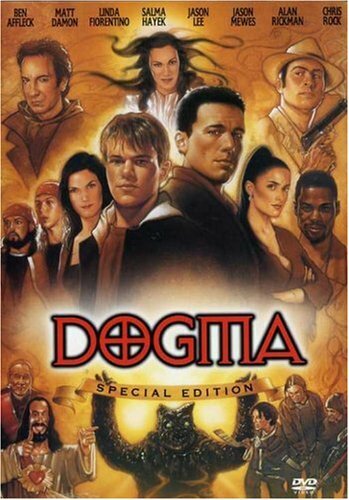 "Dogma" is another fine View Askew effort. This DVD sports a great presentation, and despite no documentary, the special edition content is pretty tremendous. Check out, and don't worry, this movie really isn't offensive.